Good day crafty friends! I hope you will play along with our Challenge this week at Tuesday Throwdown. The theme is called Frame It! Our sponsor is MyGrafico and they provided the design team with some digital frames for our creations. I used this fun star frame to make a Good Job Card. We would love to see what you come up with for the Frame It! Challenge. You have until mid-day on Monday March 7th to link your creation. Click here for all the challenge details and to view the design team inspiration. 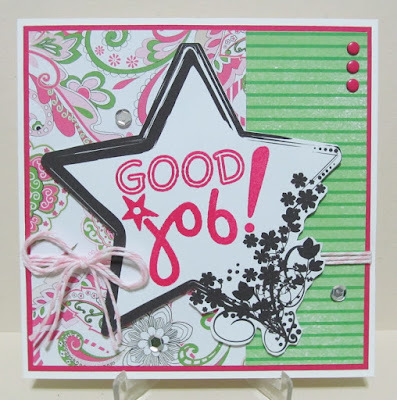 To make this Star Frame Good Job Card, the star had to be larger to fit the Good Job sentiment by Stampology. So, I made a 5.25" square card. All papers are from my scrap bin and I added some pink twine from The Twinery. Three sequins and three candy dots were added for detail and this card was done. Thanks for stopping by!